Sariska Wildlife Sanctuary is located in Alwar district of Rajasthan. This national park is nestled amidst the Aravali Hill ranges which gifted it with sharp cliffs, narrow valleys, dry deciduous forests and diverse collections of flora and fauna species. Sariska National Park was once the hunting reserve of the royal family of Alwar which was declared as a wildlife sanctuary in the year 1958. In the year 1979, it came under the ‘Project Tiger’ and was declared as a tiger reserve as well as a national park. This national park is spread over an area of 800 sq km which is divided into the grasslands, dry deciduous forests, sheer cliffs and rocky landscapes. Out of 800 square kilometers 480 square kilometers forms the core area of the national park which is famous for its diverse collections of flora and fauna species. Sariska National Park is home to many animals, birds, reptiles and insects. Some of the most sighted carnivores are Jackal, Leopard, Jungle Cat, Wild Dog, Hyena and Tiger. And some of the easily seen herbivores are Chitel, Nilgai, Sambar, Langur, Chausingha and Wild Boar. 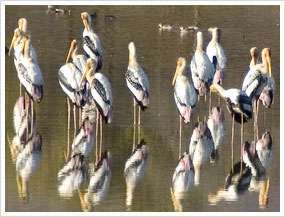 With these wild animals Sariska is also known for its large number bird’s species. Some of the popular birds which can be seen in this sanctuary are Grey Partridge, Sand Grouse, Golden backed Woodpecker, Great Indian Horned Owl, Peafowl and Crested Serpent Eagle. Inside the Sariska Wildlife Sanctuary one can find the ruins of medieval temples of Garh-Rajor which date back to the 10th and 11th centuries. Inside the sanctuary there is a 17th century castle through which tourists can get a panoramic view of flying vultures and eagles. Though tourists can visit Sariska wildlife sanctuary throughout the year yet the best period to visit is during the months of October to June. The nearest airport from Sariska is Jaipur, situated at a distance 107 Km and well-connected to major cities such as Delhi, Mumbai and Jodhpur. Alwar at a distance of 37 km is the nearest railway station from Sariska. From Alwar tourists can hire a taxi to reach Sariska. There are also regular bus services from Alwar to Sariska. Sariska National Park is situated on the Delhi-Alwar-Jaipur Highway. Regular bus services link Alwar to major destinations in and around Rajasthan and Delhi. During Sariska Tour tourists can find good and reasonably priced accommodation in and around Sariska National Park. Choices range from forest lodges to the former royal residence of the Maharaja of Alwar. Sariska Palace Hotel, RTDC Tiger Den Tourist Bungalow, Siliserh Palace Hotel, Hotel Lake Palace are some of the popular hotels and resorts in Sariska.